Victim of Beauty/ Nightmare in Columbia County. Beauty queen Dawn Smith seems to have a perfect life. She is charming, stunningly pretty, has loving parents and an exceptionally close relationship with her younger sister Shari. Their bond is tragically put to the test when one day, Shari disappears, the victim of a sadistic kidnapper. William Devane & Jeri Lynn Ryan. Beauty queen Dawn Smith seems to have a perfect life. She is charming, stunningly pretty, has loving parents and an exceptionally close relationship with her younger sister Shari. Their bond is tragically put to the test when one day, Shari disappears, the victim of a sadistic kidnapper. For Dawn, life is about to become a waking nightmare as the kidnapper makes contact and reveals a sick obsession with her beauty. 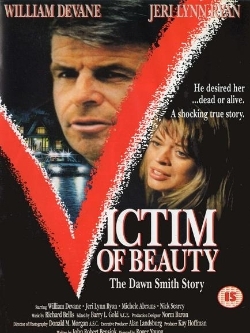 Sheriff Metts (William Devane) helped by over 1000 volunteers from the local community leads the desperate hunt to find Shari before time runs out. When the kidnap case becomes one of murder, the shattered Dawn must rally her strength and courage to help outwit the cold-blooded killer and put him where he belongs on Death Row.